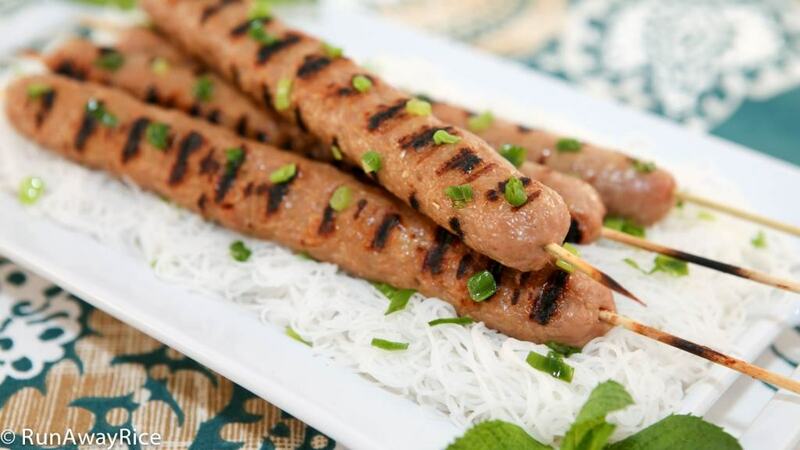 I love making these homemade Grilled Pork Sausages (Nem Nuong) because I can control exactly what goes in them. No random animal parts, preservatives or red food coloring in this recipe. It’s super simple and you’ll love the way these sausages taste. 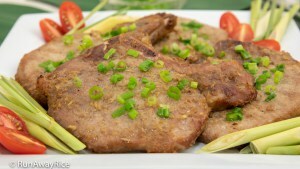 This is a great meat dish to grill for your outdoor events but they can also be cooked indoors as well. So, don’t dismiss this tasty dish because of the word “Grilled”. Below I share the different cooking methods. Give it a try and let me know what you think! If you don’t have a stand mixer, use a hand mixer. You may need to mix for another minute or so to evenly blend the meat. I use the whisk attachment instead of the paddle because it blends better giving it a nice, smooth texture. If you would like a rougher texture, feel free to use the paddle attachment. Another option is to ask your butcher to finely grind the pork for you and then you can mix everything by hand. Feel free to substitute the pork with any ground meat of your choice. Ground chicken sausages are delish too! For health reasons, I use a lean pork: 90% pork/10% fat. If you would like a juicier sausage, use a meat/fat ratio like 80/20 or more fat depending on your preference. The thickness of the skewers is approximately the same as a hotdog. Everyone always asks “What if I don’t have the Vodka 5-Spice Marinade?” My response: Well, go make it already! 🙂 Ok, if you don’t have this wonderful marinade, you can substitute with 1/2 tsp of 5-spice powder. You can freeze any leftovers. Store them in a freezer storage bag and they’re good for up to 3 months. To reheat, defrost first and then warm them in the oven or microwave. Add the brown sugar, roasted rice powder, onion powder, baking powder, ground white pepper, minced garlic, fish sauce, Vodka 5-Spice Marinade, and vegetable oil into the mixing bowl. Mix on Low speed for 1 minute. Add 1/2 of the ground pork and mix together on Low speed for 1 minute. Add the remaining pork and again mix on Low speed for 1 minute. Scrape the meat from the whisk attachment and back into the bowl. Mix on Medium speed for 3 minutes. Divide the meat mixture into 8 equal portions, approximately 4 oz each. Place a piece of plastic wrap that’s a little longer than the bamboo skewer on the work surface. Take one of the meat portions and flatten it onto the plastic wrap, making a log that’s approximately 2-inches wide by 9-inches long. Please a bamboo skewer in the center of the log. Holding the plastic wrap on either side, use it to press the meat together covering the skewer completely and forming a log. Wrap the log completely in the plastic wrap and gently roll it on the work surface to evenly distribute the meat. Unroll the plastic wrap. Dip your fingers in a little bit of water and smooth it over the sausage pressing down on any uneven areas. Continue until all 8 sausage skewers are made. Roll the meat mixture into balls approximately 5/8 oz each. Wet your hands with water when they get sticky. 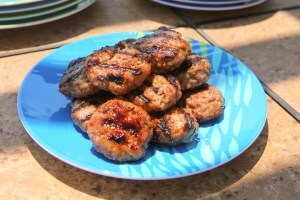 There are a few different ways to cook these pork sausages, my favorite is with the indoor grill. Heat the grill over Medium heat until it’s hot. Brush the grill pan with a generous amount of vegetable oil. Grill the sausages for 15 minutes rotating every 5 minutes so they cook evenly. As the sausages are cooking brush them with a bit of oil so they don’t stick to the grill pan. Grill the sausages for approximately 10 minutes rotating every few minutes. As most outdoor grills are quite hot, you don’t need to cook for as long. Remember to rotate often so they cook evenly. Coat a baking sheet with vegetable oil. Bake at 375 degrees Fahrenheit: 20 minutes for the skewers and 15 minutes for the meatballs. Rotate the sausages about halfway through the baking time so they cook evenly. Set the oven to broil for the last 5 minutes to brown the sausages up even further. Enjoy these sausages hot or cold! 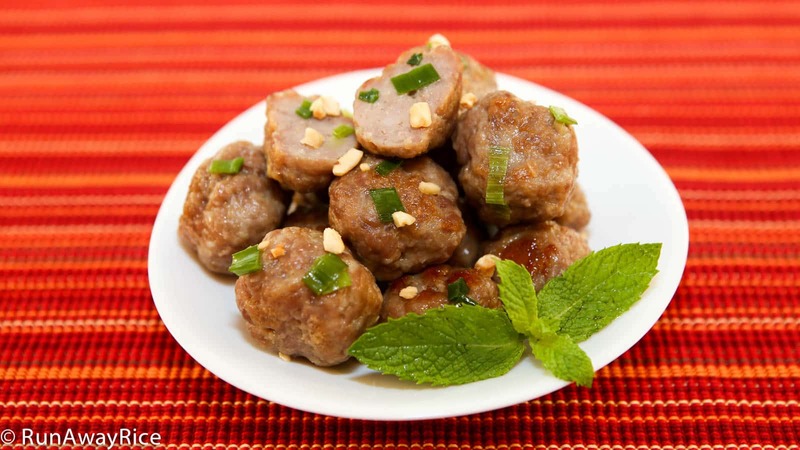 These meatballs make great party appetizers. Pair them with your favorite dipping sauce. I don’t have a picture of this yet but these sausages make an amazing sandwich. Place the skewers or meatballs inside a French baguette, add Homemade Mayonnaise, cucumbers, Carrot and Radish Pickles, jalapenos and cilantro for a scrumptious sandwich! 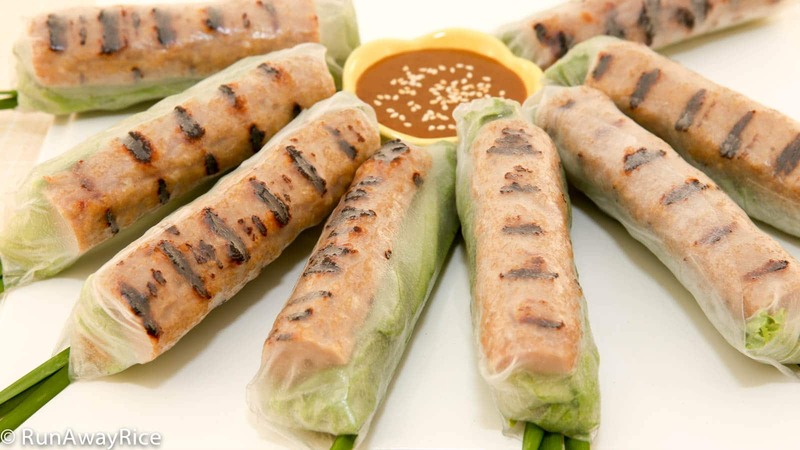 Make these delicious Grilled Pork Sausage Fresh Spring Rolls with this must-have dipping sauce. It’s the most mouth-watering combination and will become your favorite! 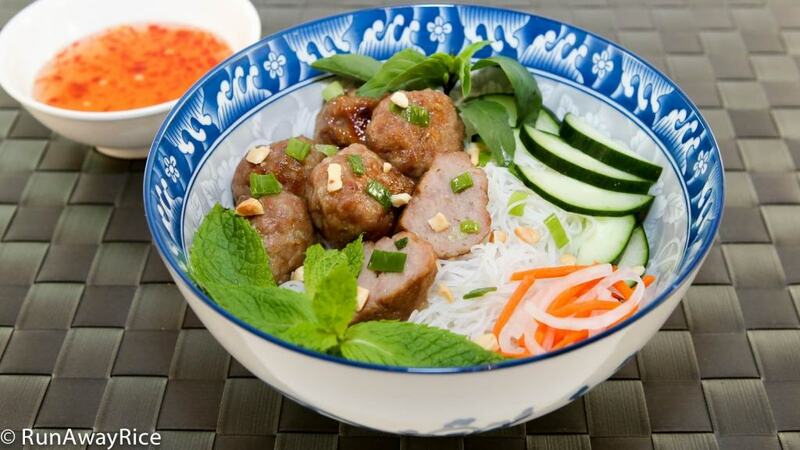 Hi Trang, I made nem nuong the other day using your recipe. It was easy and yummy, so I made it again the next day. Still easy and yummy . Thank you for the great recipe. 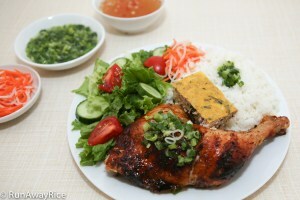 Do you have a recipe to make cơm rượu that you can share? Sounds like a really great recipe. I will definitely try it. I am also wondering if you would tell me if there is a substitute ingredient for the 5-spice vodka marinade. I have not seen this in Asian supermarket. You can substitute the marinade with 1/2 tsp 5-spice powder. Enjoy! thank you very much for your good recipes.we loved it . Thanks Lillian, good luck and enjoy the recipe! Thank you for showing us your technique to wrap spring rolls perfectly! I really enjoy all your recipes. You are most welcome and I am happy to hear you found my tutorial helpful. Thanks for stopping by! Thank you for this excellent recipe. I like the way you use the mixer , it improve the texture of the meat .